They were chanting "Bruuuuuce" at Bonnaroo all weekend, as Bruce Springsteen performed a three-hour set with the E Street Band one night and joined Phish on stage another. Springsteen and Phish were the headliners at the eighth annual festival, held on a giant farm in the Tennessee hills. Phish first played Friday night, then Springsteen played Saturday. The two worlds - far apart in rock 'n' roll - combined during Phish's closing set Sunday night. Phish frontman and guitarist Trey Anastasio introduced Springsteen as "my boyhood hero and still hero." Anastasio recalled seeing Springsteen perform when he was young as a foundational experience, forever giving him unrealistically high expectations for concerts. With Springsteen as lead vocalist and joining Anastasio on guitar, they played Mack Rice's "Mustang Sally" and Springsteen's "Bobby Jean" and "Glory Days." Anastasio beamed throughout while the Boss immediately played bandleader, even calling for a "little more keyboard" for Page McConnell. It was a symbolic moment for a Bonnaroo notable for its musical cross-pollination and expanded view of what it means to be a "jam band." Though Bonnaroo was founded as a roots-rock, jam band festival, it years ago adopted a wider musical spectrum that draws from all genres, including hip-hop, heavy metal and pop. Bonnaroo's origins were easy to recall with Phish - today's pre-eminent jam band, reunited after a five-year hiatus - performing for the first time together at Bonnaroo, a festival founded in the image of the Vermont band's destination concerts. But as Bonnaroo has grown to become arguably the country's biggest music festival, its essence still remains centered on live performance and virtuosity - which came in all sounds over the weekend. Springsteen might rarely deviate much from his decades-long catalog, but he (again) proved there's no better showman in rock. Across three hours, he repeatedly ran into the crowd, leaning out across the barricades, taking requests - even the out-of-season "Santa Claus Is Comin' to Town" - and dancing with a young, awe-struck girl. The Boss also struck a tone mindful of the current economic climate. Along with his songs about down-on-their-luck characters and blue collar life, Springsteen encored with Stephen Foster's Civil War-era "Hard Times Come Again No More." "You pick up the newspaper and you look out and you seen millions of jobs here in the country lost. 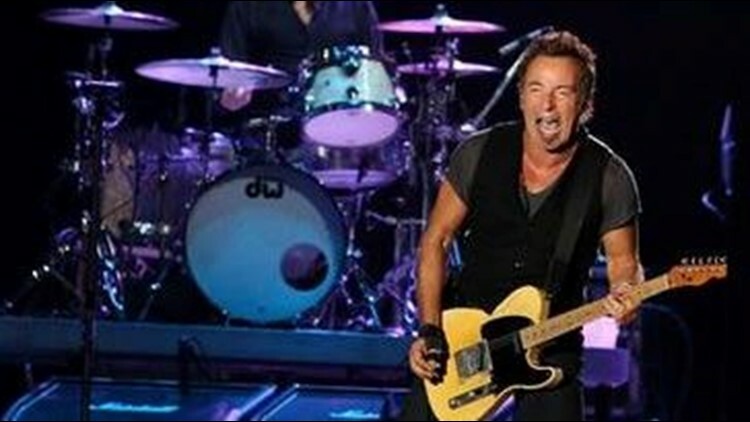 Hundreds of thousands of jobs every month," said Springsteen. "You see things that I never thought I'd see. There's many, many folks struggling out there." He wasn't the only one to touch on the recession. Jenny Lewis, the singer-songwriter who sometimes fronts the California band Rilo Kiley, introduced a new song about today's times, noting she comes from "a state that's totally bankrupt." On the song, "Big Way," she sang, "They're gonna get you in a big way." But Springsteen was far from the only showman at Bonnaroo. Few weren't impressed by The Rev. Al Green's performance Friday afternoon. The 63-year-old Memphis resident sang his soul classics - "Let's Stay Together," "Here I Am" - with a gospel flair, hitting high notes that he said proved he still had it. Wanting to come down and dance with the crowd - whom he tossed roses to - Green admonished the "yellow shirts" (the security guards): "We didn't come out there to hurt nobody. We came to love." There were many neo-soul acts at Bonnaroo who showed influence from Green. Among them: Raphael Saadiq, who sped up his pace on his "100 Yard Dash," and an afro-less Erykah Badu, who performed a slow-burning set Sunday afternoon. She was followed by Snoop Dogg, who declined a lazy summer show and instead rocked with a bass-thumping, audience-bouncing performance. Green played at nearly the same time Friday as David Byrne. Some hoped they would unite to perform Green's "Take Me to the River," which Byrne memorably covered when he was with the Talking Heads. Instead, Byrne played it himself. It was part of a memorable set of art funk for Byrne, who brought his conceptual stage show of dancers to Bonnaroo. Many other pairings between the 100-plus acts at the festival did happen. The Beastie Boys were joined by Nas to perform a new song off their upcoming record. Elvis Costello, who performed solo, joined Lewis for her "Carpetbaggers." Byrne, who curated a stage on Friday, hopped up to sing with the buzzed-about Dirty Projectors. Jimmy Buffett was a late addition and joined his Coral Reefer All-Stars, who were being led by his recent discovery, guitarist Ilo Ferreria. Buffett said he had some difficulty adjusting to the early noon showtime (especially for a festival that goes until 4 a.m.) but said margaritas were still in order. Some of the best jamming came from the tent devoted to African music on Friday. Femi Kuti, Amadou & Mariam and - in particular - "Vieux" Farka Toure played top notch Afropop from West African. Toure, the son of Mali legend Ali Farka Toure, tore through bluesy, funky tunes. He led the crowd in a chant, only afterward informing them of the translation: "Love is good." The same tent on Saturday transformed into a bluegrass stage featuring the Del McCoury Band and the David Grisman Quintet. There, the solos became fast-paced banjo and acoustic guitar flourishes. And some of the strangest, most psychedelic jamming came from the mostly electronic outfit Animal Collective, who hypnotically pushed their "Fireworks" past the 10-minute mark. Ashley Capps, the co-founder of Bonnaroo and the president of AC Entertainment (which produces the festival with Superfly Productions), said about 75,000 attended. That's up significantly from last year's fest, no doubt partially thanks to the thousands of devoted Phish fans who were eager to see their reunited band. Capps acknowledged Thursday, with its pounding thunderstorms and tornado warnings, was "a challenging night." But the rest of the festival was marked by mostly sunny, clear and hot weather. Capps said it was one of the smoothest-running Bonnaroos yet. None benefitted from the good weather more than Wilco, who played a scintillating sunset performance Saturday, running the gamut of their earlier material as well as songs off their upcoming disc, "Wilco (The Album)." The band played on the main stage before Springsteen, and Wilco frontman Jeff Tweedy could already feel the Boss's presence. "If anybody boos us tonight, we have a built-in excuse," said Tweedy. "They're just yelling 'Bruuuuuce.'" Any summary of the festival is sure to leave many out. Others performing included: Nine Inch Nails, TV on the Radio, Yeah Yeah Yeahs, Public Enemy, Gov't Mule, Grizzly Bear, Lucinda Williams, Santigold, The Decemberists, the Mars Volta, moe, Of Montreal, Ani DiFranco, Andrew Bird, Girl Talk and Neko Case.